The mechanical fruit machine gets an update – Fruit Bonanza. Tendrils of passion-fruit vines coil around the reel frame and a cornucopia of mixed fruit, the game’s logo, surmount the reels against a vivid green background. Fruit Bonanza from Play’n GO software is a slot title that uses bright modern graphics to update a classic slots theme; the fruit machine familiar from the earliest mechanical slots, accompanied by cheerful honky-tonk music. The five reels are designed as old-fashioned white drums, displaying three symbols each through narrow metal-framed windows. The game has only 9 pay lines and a limited number of special features, in keeping with the vintage theme. But Fruit Bonanza’s four different progressive jackpot options are bang-up-to-date. Fruit Bonanza has only eight ordinary symbols to make winning combos, and true to the theme, there is nary a poker icon to be seen. The symbols are all 3D updates of the original fruit machine symbols, starting with the iconic three cherries, which win prizes of 10, 50 or 100 coins for three, four or five matches on a pay line. In increasing order of value, the rest of the symbols are an orange, a strawberry, a pineapple, a four-leafed clover, a horseshoe, a gold bell and a lucky number 7. The bell and the 7 are the top-paying ordinary symbols, paying 2,000 coins and 3,500 coins for five of a kind, respectively. The strawberry, pineapple and bell also pay consolation prizes of 5 coins for just two matches, while a match of two 7s wins 7 coins at online slots casino Australia. Also in keeping with the retro theme, Fruit Bonanza has no Wild symbol and no way to trigger a free spins round. This is offset by the relatively high-value prizes though. What Fruit Bonanza does have, is a Scatter symbol in several fruity colours. Scatters trigger wins in any position on the reels, and do not have to appear on the same pay line. Any two or more Scatters wins the player a multiplier of the total bet per spin. The multipliers are X2, X5, X20 or X400, for two, three, four or five Scatters, respectively. The cornucopia of fruit is the highest-paying special symbol in Fruit Bonanza. The game allows players to bet from 1 to 5 coins of a 0.10 denomination on each of the 9 pay lines. If the player is staking less than the maximum number of coins, three, four or five cornucopias on a pay line win 50, 500 or 5,000 coins. If the player is staking the maximum number of coins, three or more cornucopias trigger successively larger progressive jackpots. Three of a kind on any pay line wins the Fruit Jackpot, four of a kind wins the Juice Jackpot and five of a kind wins the Bonanza Jackpot. If the player scores five cornucopias on pay line 9, they win the top progressive, the Super Jackpot. 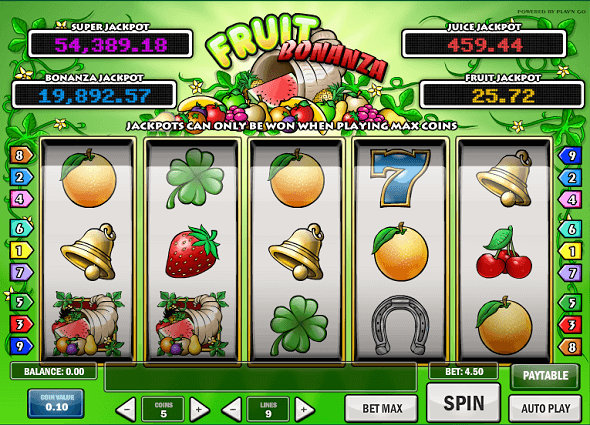 Depending on the casino at which the player is accessing Fruit Bonanza, these jackpots can be quite substantial.